In honor of the Nikola Tesla Birthday on July 10th, I would like to send you to a few of my favorite web sites about Tesla. He was truly a fascinating man and inventor. 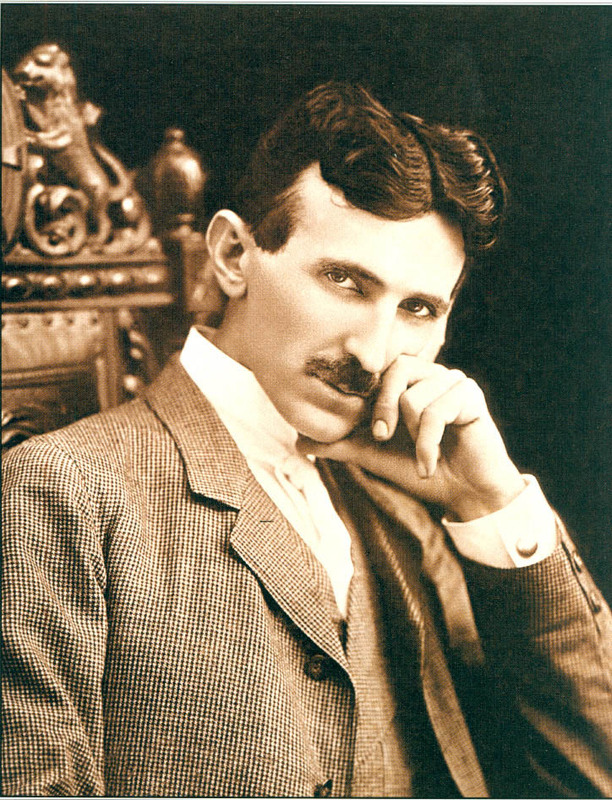 His alternating current generator, motor, and transformer inventions are among the top 10 greatest inventions of all time. You use his inventions many, many times every single day of your life. The electricity generating system I describe in my book, "Electricity - Make it, Don't Buy it" , uses his AC generator as a main component. I also have a whole chapter on Tesla in my book. Not only was he a great inventor, but his life story is very interesting reading too. Did you know?... In addition to inventing the modern day AC electrical system, Tesla's greatest invention (in his own mind) was the Tesla Turbine. It could be used as a pump and a bladeless turbine too with an efficiency up to 97%. He also invented radio BEFORE Marconi. This was taken to court and Tesla won - yet we still credit Marconi for the invention of radio - why? Tesla also invented the first robotics, remote control, and drone technology with his remote controlled submarine. He also holds a patent on the first VTOL (vertical take off and landing). This is the very same technology that the modern day jump jets use and helicopters too. Of course he also pioneered the transmission of electricity without wires. He was the master of harmonics and resonance which is the secret behind free energy and overunity. I could go on and on, but I don't have the time - just read over the material at the links below and you'll see that he was surely a genius! I carried out several experiments transmitting energy towards the Moon. Through these experiments I discovered that the Earth is surrounded by an electric field. This field kept destroying faint ether vortical objects. Ether vortical objects possessing big energy, burst through electric field of the Earth and extended into interplanetary space. And right here, the idea came to my mind that if I can create a resonance system between the Earth and the Moon, then power of the transmitter may be very small while the energy derived out of this system could be considerable. Having made the calculations on how much energy can be derived I was surprised at it. The calculations showed that the energy derived from this system is enough to fully destroy a big city. For the first time at that moment I realized that my system could represent a danger for the mankind. However, I still greatly wanted to carry out my experiment. Secretly, from everyone, I began to thoroughly prepare my crazy experiment. First of all, I needed to select the place for my experiment. The Arctic Zone did the best location for it. There were no people there and I would injure no-one. But the calculation showed that with the Moon being at its present position, the ether vortical object could strike Siberia, but people live there. I went to the library and began to study the information concerning Siberia. The information was very small but, however, I saw that there are almost no people in Siberia. I should keep my experiment a deep secret, otherwise the consequences could prove to be very unpleasant for me and for all mankind. I always worry about one question: 'Will my discoveries be for the good of the people?' Because it had been known for a long time that the people used all inventions to extirpate the similar ones. The fact that much of my equipment in my laboratory has been dismantled to that moment considerably contributed to keeping my secret. However, I could save the equipment I required for my experiment. I alone assembled a new transmitter out of this equipment and connected it up to the emitter. The experiment with such a big quantity of energy could be very dangerous. If I made a mistake in my calculations the energy of ether vortical object would strike astern. That’s why I was not in the laboratory but two miles outside it. The work of my installation had been operating by clockwork. The principle of the experiment was rather simple. In order to better understand its principle it is necessary to grasp first what are the ether vortical object and ball lightning. Basically, they are the same. The only difference is that the ball lightning is a visible ether object. Visibility of ball lightning is provided by fluorescence of charged air particles. It could be compared with ink coloring of water vortical particles in my experiment in the pool. In order to create a resonant Earth – Moon system it was necessary to create a concentration of charged particles between the Earth and the Moon. For that, I used a property of ether vortical objects to capture and transfer charged particles. The generator has emanated the ether vortical objects towards the Moon. When passing through the electric field of the Earth, ether vortical objects have captured charged particles within it. As an electrostatic field of the Moon has the same polarity as an electric field of the Earth, the ether vortical objects have been reflected from it and this time, again returned to the Earth at another angle. After returning to the Earth the ether vortical objects have been reflected again by electric field of the Earth back to the Moon… That was the way, by which the Earth – Moon resonant system has been occupied by charged particles. When the required concentration of charge particles in resonant Earth – Moon system was achieved it has been energized itself at its own resonant frequency. The energy million times assisted by resonance properties of the system was being changed into ether vortical object of a huge power within the electric field of the Earth. However, it was only my guesswork, and I didn’t know how it would be in reality. I remember very well the day of experiment. The estimated time came near. Minutes dragged on so slowly and seemed as if they were years. I thought I would go crazy of this waiting. At last, the estimated time came and … nothing happened! Another five minutes passed but nothing unusual took place. Various theories came into my head: maybe the clockwork hasn’t worked, or the system hasn’t snapped into action, and maybe nothing must happen at all. I was on the verge of insanity. And suddenly … It seemed to me that the light has grown dark for a moment and a strange feeling was being sensed throughout all my body - as if thousands of needles were piercing my body. Soon everything was over but there was an unpleasant metallic after-taste left in my mouth. All my muscles had become relaxed and there was a buzzing in my head. I felt totally worn out. When I returned to my laboratory I found that it was practically intact, just there was a strong smell of burning in the air... And again, agonizing suspense had seized me, as I didn't know the results of my experiment. And only later on, having read about unusual phenomena in the newspapers, did I realize what a dreadful arm I have created. Of course, I expected that it would be a very heavy explosion. But, it has not been even an explosion - it has been a catastrophe! After that experiment I determined that I would keep the secret of my invention until I die. Of course, I knew that someone else could easily repeat this crazy experiment. But this would require the acknowledgement that the ether exists but our scientific world moves further and further away from the truth. I am even grateful to Einstein and others because through their erroneous theories they lead mankind away from that dangerous path I followed. And, probably, this is their only merit. Perhaps, in about one hundred years, when reason prevails over the brute, my invention will serve for welfare of people. the pictures have been restored and colorized. Simply amazing!